I was browsing a book of Middle Eastern poetry and prose, looking for something that might lift the spirit of those weighed down by the Christchurch tragedy. Almost the last poem in the collection Tablet and Pen is by a young Iranian American poet, writer, satirist and calligrapher, Hamid Reza Rahimi. 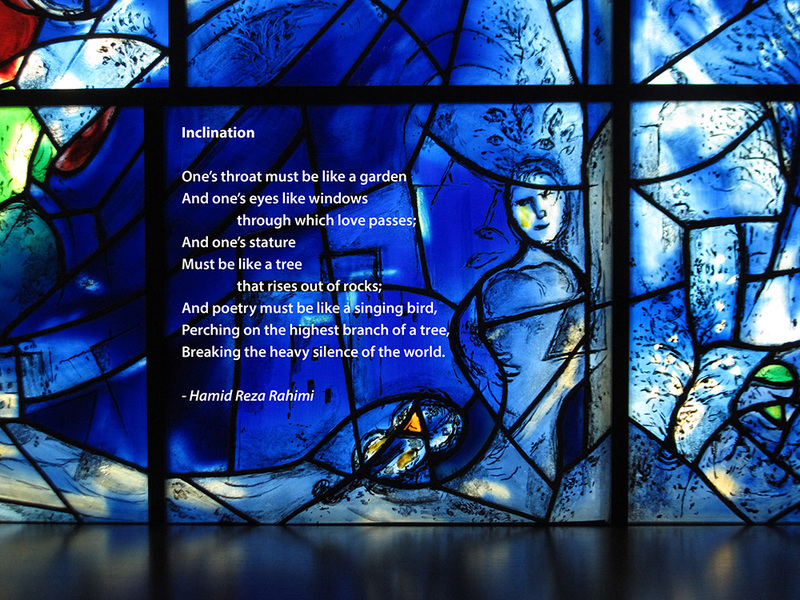 (Tablet and Pen says that Rahimi fled to exile in 1986 “because of his overt opposition to the Iranian government, which had forbidden him to write.”) I wanted to pair the poem with a photograph, and found one I had taken in Chicago, at the Field Museum, of a Marc Chagall stained-glass window. Chagall is an artist through whom beauty passes as if through a window, and his glass art, with Rahimi’s words, seem a glowing match.